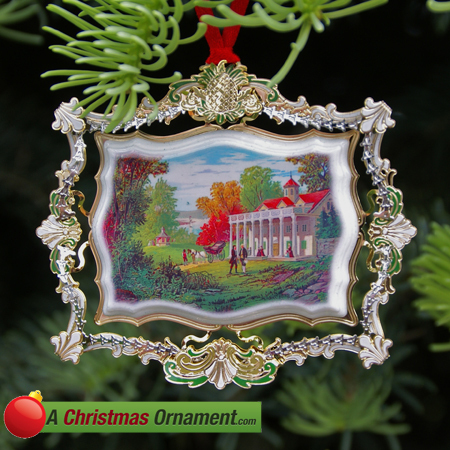 Christmas Ornaments Made in USA - 2012 Mount Vernon Holiday Ornament - A Christmas Ornament Co.
For 2012 the official Mount Vernon ornament portrays the tremendous hospitality of George and Martha Washington at their mansion, Mount Vernon. Their hospitality is the stuff of legend: as an example, following the war, they welcomed overnight guests on 225 of 365 days recorded in 1785. The Washington's were extremely social people: after being personally invited for a visit, James McHenry responded with a letter that stated in part: "It would give me infinite pleasure to spend a few days at Mount Vernon, and to pay my respects to you and Mrs. Washington in your place of peace of hospitality." Additionally, years later Martha Washington's youngest granddaughter, Nelly Custis Lewis, commented to her friend: "Many were annually fed and clothed from his [Washington's] and Grandmama's hands, besides the charity almost daily bestowed upon wayfaring persons." It has been confirmed that total strangers would stop by the estate if they were in the area for assistance or a meal. Ornament is finished in 24k gold and is inscribed on the back.